Several months ago, I found the most gorgeous purple-and-gold calico at one of my favorite shops. 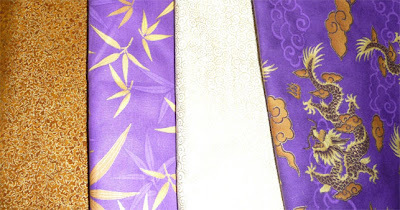 It has a Chinese design of gold dragons whipping around a purple sky. I fell in love with it instantly and bought a meter so that I'd have it. It's been in my UFO closet since then. 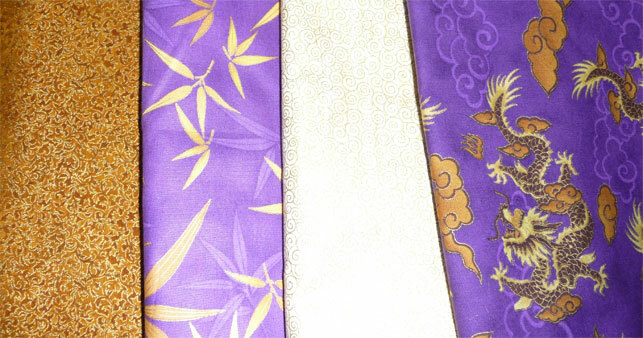 Still no design, but I'm happy now that I've got a well-marrying purple to go with the dragon print, plus a couple of complimentary prints in gold/copper. Ah...! Finally... I'm off and running with this one. 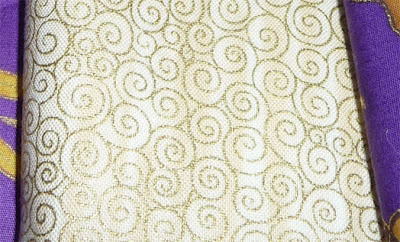 I'm still working on the "Forbidden Palace" quilt - it's slow going, but I have hope that I'll finish it before the end of this month. 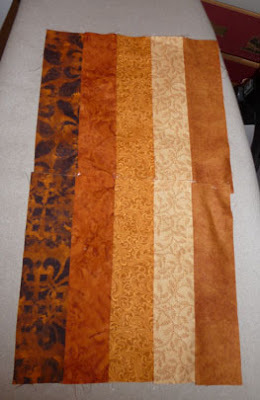 With that in mind, I need to look ahead and think about getting another quilt top done so that when I do finish "Forbidden Palace", there's another project waiting in the wings. It has the fabric for my queen-sized spread design I'm calling "Trees" (a quilt that I designed last year, but hadn't made much headway on). 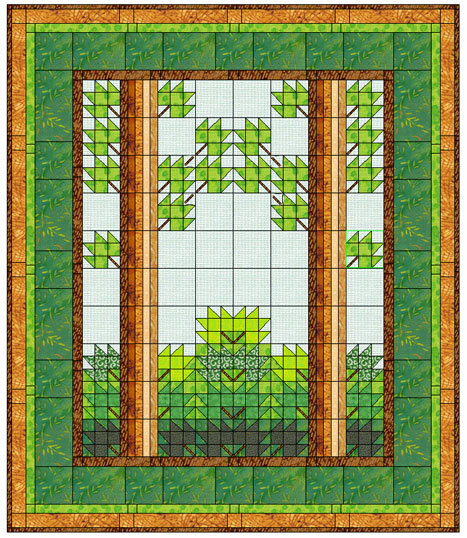 I'm looking forward to getting into this one; it involves leaf-blocks, a kind of block I've not done before. So Quilt 11, here we go! There are three kinds of stores that I simply can't go into without buying something: plant stores, fabric stores, and book stores. I dropped into the Belgrave Book Barn to see how my book was selling, and of course ended up walking out with a book - on this occasion, a quilting book. 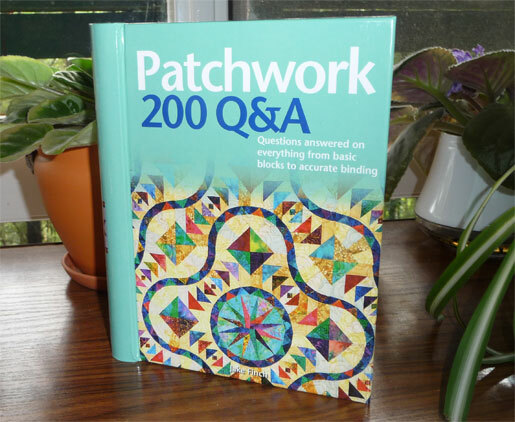 "Patchwork: 200 Q&A" by Jake Finch (a man wrote a quilting book?) is just about perfect for me at this stage of my development as a quilter. 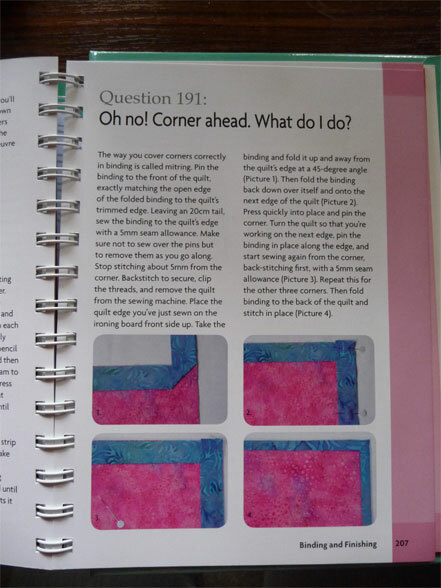 It's arranged in colour-coded sections, each section covering a different aspect of quilting. There are illustrations showing of a nice selection of block types - but not so many as to be overwhelming. I'm especially pleased that so many of the blocks shown in the book use straight lines (I'm not into curvy stuff just yet). In addition to showing sample blocks, illustrations are included to show their assembly. The narrative is well written, but quite a bit can be gleaned just from glancing at the pictures. 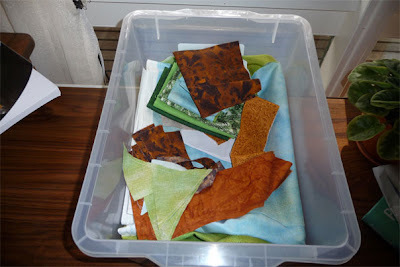 There are sections on colour selection, labelling, machine vs hand quilting, binding techniques, computer design software, and so on. Although it's not an exhaustive "everything you need to know" book, it certainly does cover the topic well. A beginner could use this book to learn basic techniques, but should be warned that the book isn't arranged to show the sequence of steps someone might go through. The information is there, just not in "step-by-step from beginning-to-end" form. It's really more for someone like me, who's done a couple of quilts and now wants to learn a bit more. The ringed binding makes the book lie flat, which is EXACTLY what you want if you are going to try to use the book while you are working.